When you think of horse racing and New York State, it is almost impossible for Saratoga Springs not to come to mind. Dating back to 1863, it is arguably one of the most important pieces of history in the whole state. 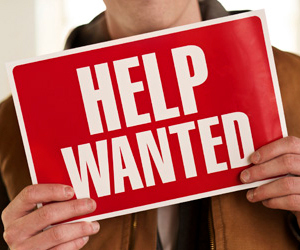 All summer the local news stations report on the latest odds, race results, and up and coming horses. If you live in the area, it is impossible not to hear about “the track” during the summer. 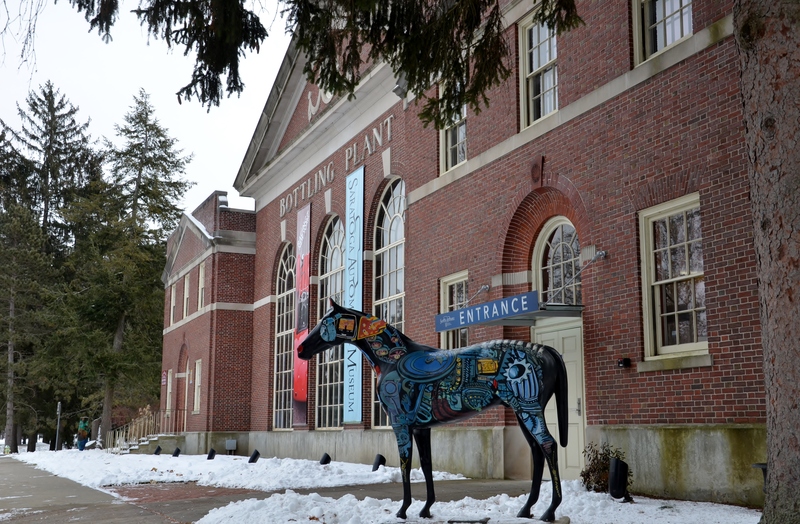 Among all of this history and publicity it is easy to forget that Saratoga is much more than just the home of horse racing. The popularity of the sport has resulted in a thriving downtown, massive houses scattered across the area, and abundant tourism. There is an entire ecosystem that has formed in the city as a result. The horse is covered in a collage of car parts, sure to satisfy enthusiasts of the automobile, while paying homage to its predecessor. But the words “Bottling Plant,” why are they there? 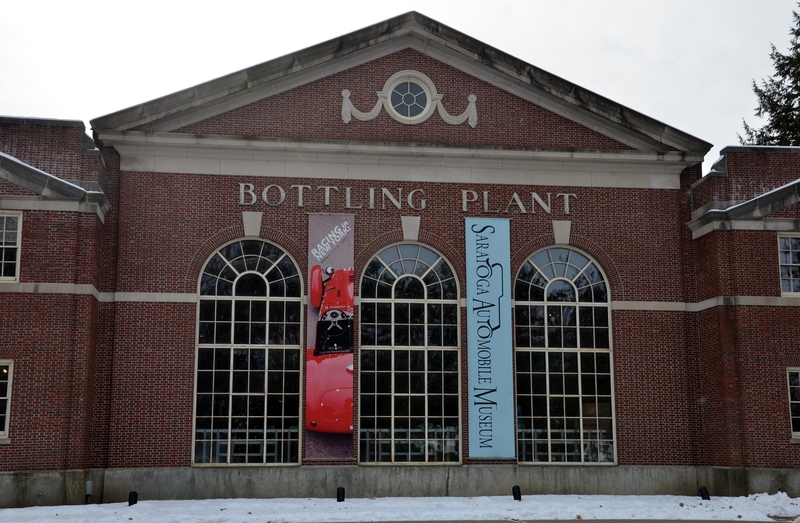 As part of President Roosevelt’s New Deal in 1933 a bottling plant was slated to be built. This was one of many projects designed to bring the country out of the Great Depression. After construction in 1935, the building was home to a state run mineral water bottling facility. This bottling facility was closed in the 1970’s though because the market for bottled water simply wasn’t big enough at the time. By their estimation, bottled water would never become a successful business venture. As a result of this miscalculation, the building was turned into a private company’s storage facility for a while, and then became vacant for many years. 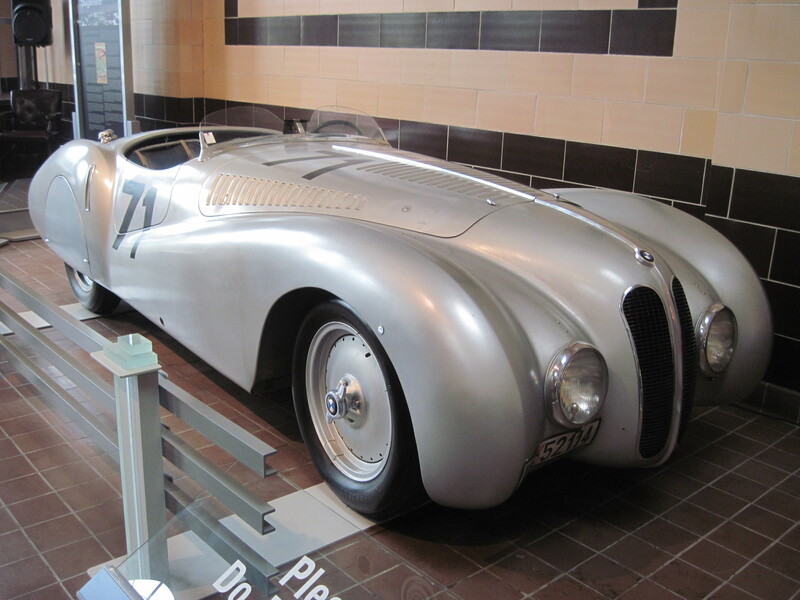 It wasn’t until the 1990’s that ideas started forming to turn the building into a car museum. By 2002, the building had been fully gutted, renovated, and had a lift added in the back to get cars onto the second floor. Since then the museum has steadily grown. Every six months the ground floor exhibit changes to a new theme. To me, this is critical to the museum’s success. Having about half of the museum’s exhibits constantly changing allows locals and dedicated followers a reason to keep going back. 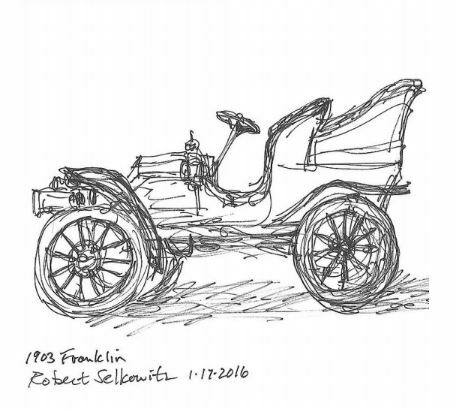 A 1903 Franklin sketch by local artist, Robert Selkowitz. There are many more on display at the museum. 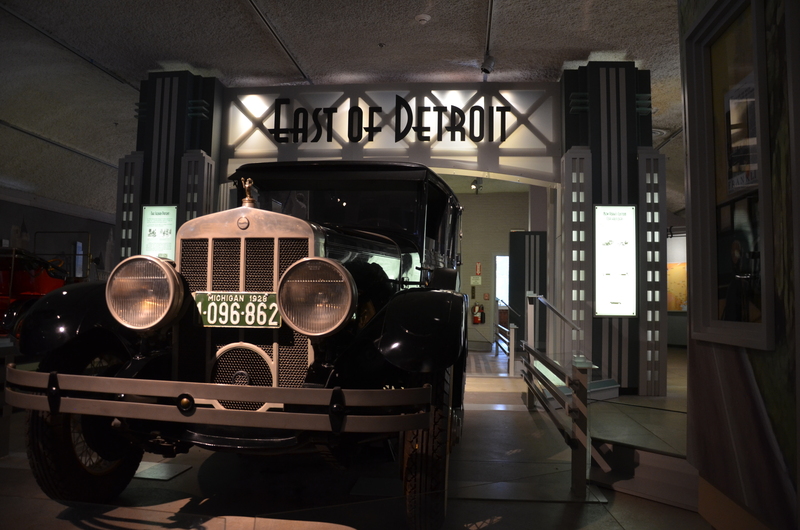 The theme of the exhibition is the Evolution of Automobile Design from 1900 to the 1960s. While I was there, the theme was “working vehicles.” As a result, there was everything from a Farmall tractor to a crushed Jeep Cherokee from 9/11. 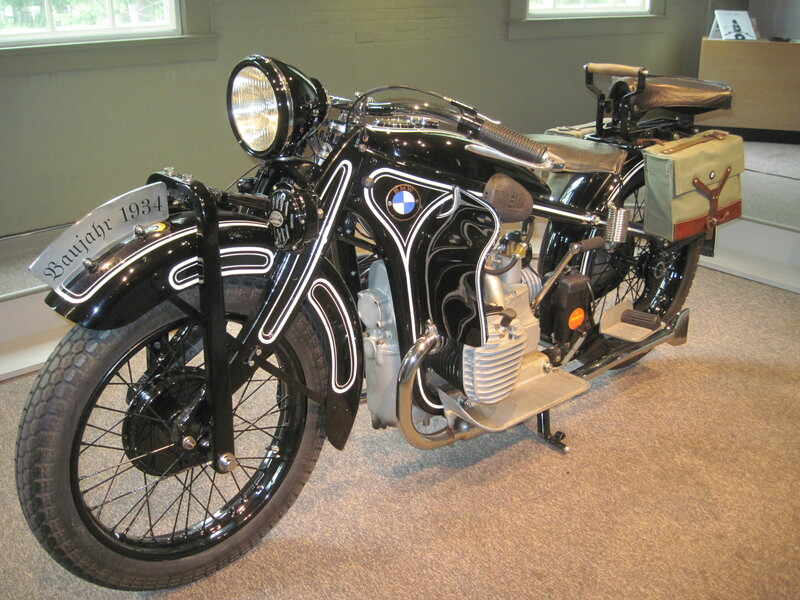 As I was given a tour of the museum, I came across one vehicle that immediately grabbed my attention. The museum had a 1957 IH Civil Defense rescue vehicle from Southbridge, MA. The truck was in perfectly restored condition, but what really impressed me was its cargo. Setup in the back were all the tools and equipment needed to deal with nuclear fallout. 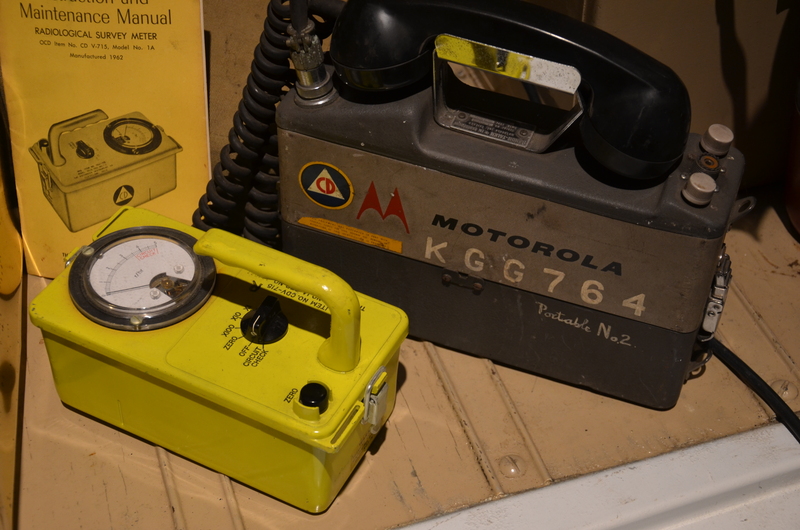 Gazing upon the old Geiger counter, phone, hardhat, and other items was a humbling experience. For many years, each and every day posed a very real threat of nuclear war for Americans. 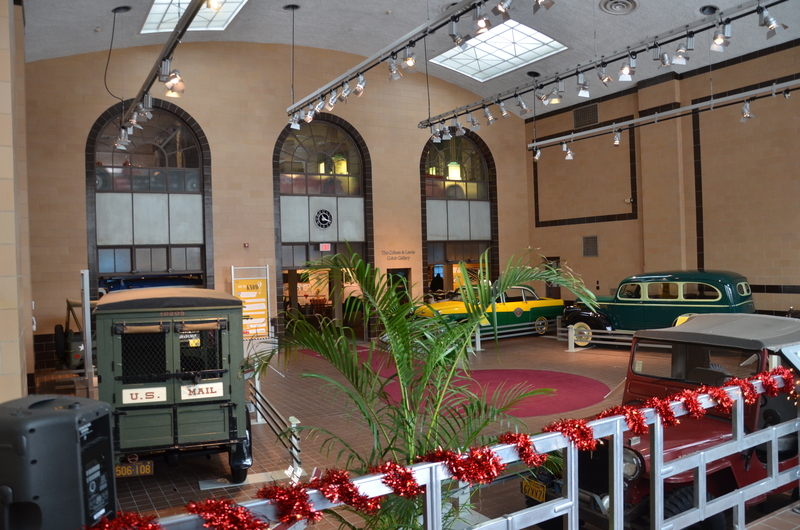 The second floor of the museum is dedicated to the history of automobile racing in New York State from the early 1900s, to more recent race cars. 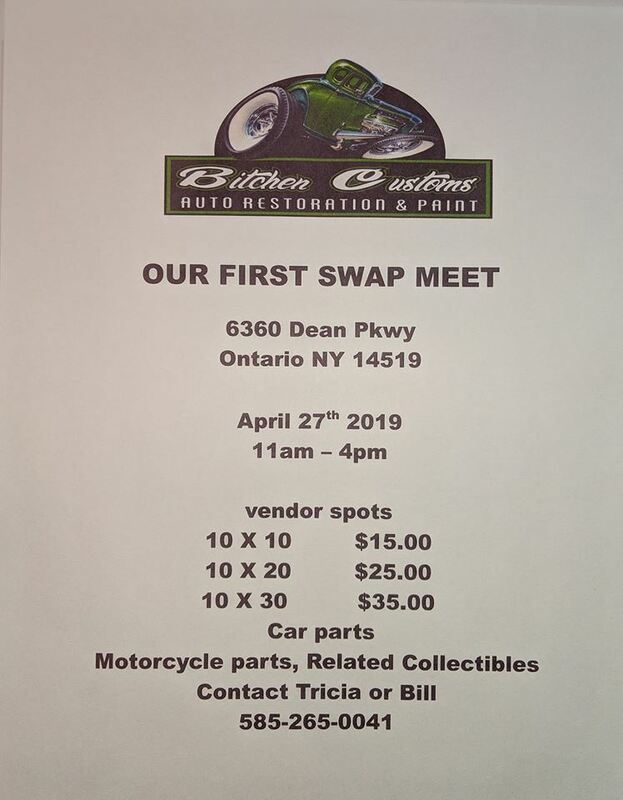 Additionally, there is the history of automobile manufacturing, with a map listing all the car builders in the cities around New York State. 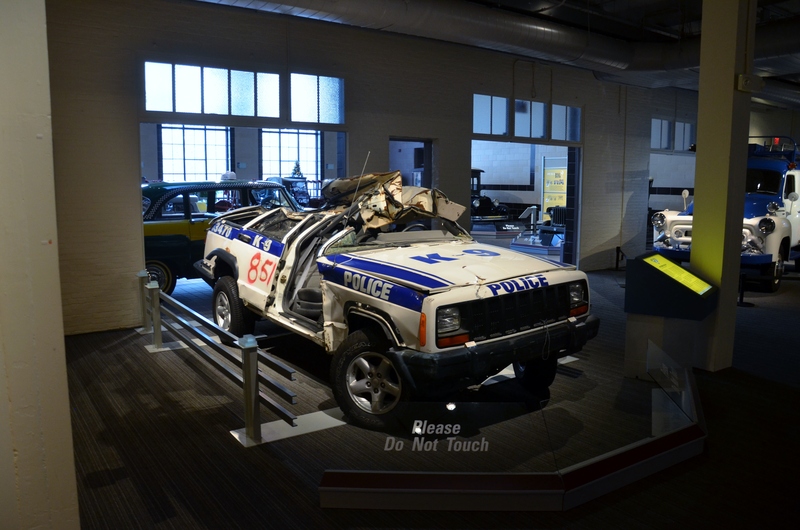 Crushed Jeep Cherokee from 9/11. In an effort to raise funds for the museum and expand their influence, last year they hired auction director Jeff Whiteside. On September 22-23rd, 2017 the museum had its first auto auction. The auction brought in over 300 cars, with an over 50% sale rate, a huge success for its first year. After speaking extensively with Jeff, he is excited for the second auction on September 21-22nd, 2018. He is confident that the turnout and quality of cars will be even better than last year. As impressive as this auction is, they didn’t stop there. Executive Director, Carly Connors, explained that the museum will also have a booth at the NY International Auto Show this January. 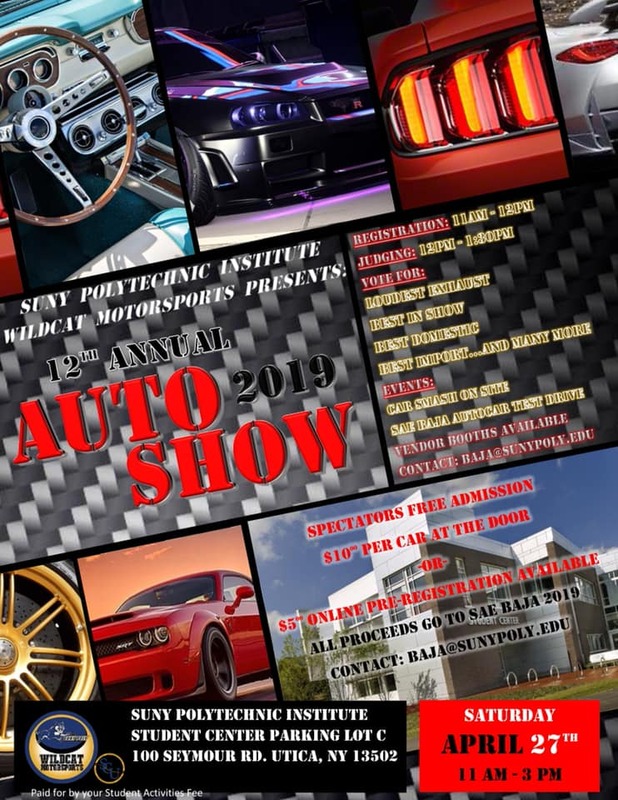 As one of the largest auto shows in the country, this is another great opportunity for them. Second annaul auction on September 21-22nd, 2018. Overall, I had a great experience visiting the museum. Everyone I met was very friendly and seemed genuinely excited to have an article written about it. With their current vision and new employees, I think the museum has a bright future and I know I will be going back to visit. I encourage everyone to check out the museum and attend this year’s auction! Franklins were manufactured in Syracuse, NY until 1934. 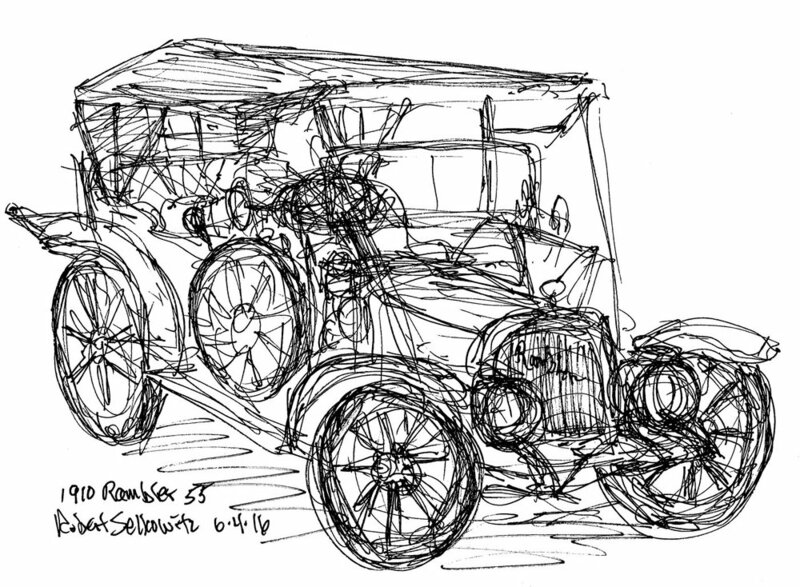 1910 Rambler Model 55 sketch by local artist, Robert Selkowitz. 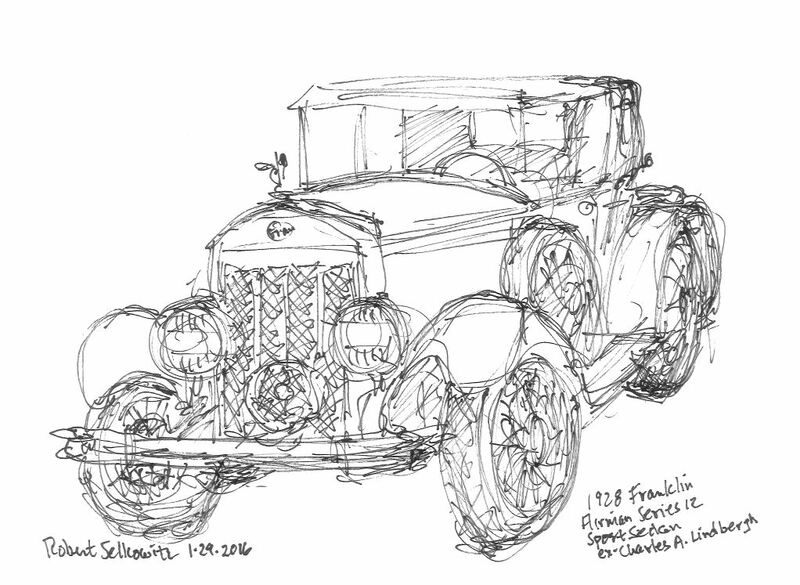 1928 Franklin, manufactured in Syracuse. 1931 Pierce-Arrow, manufactured in Buffalo, NY. 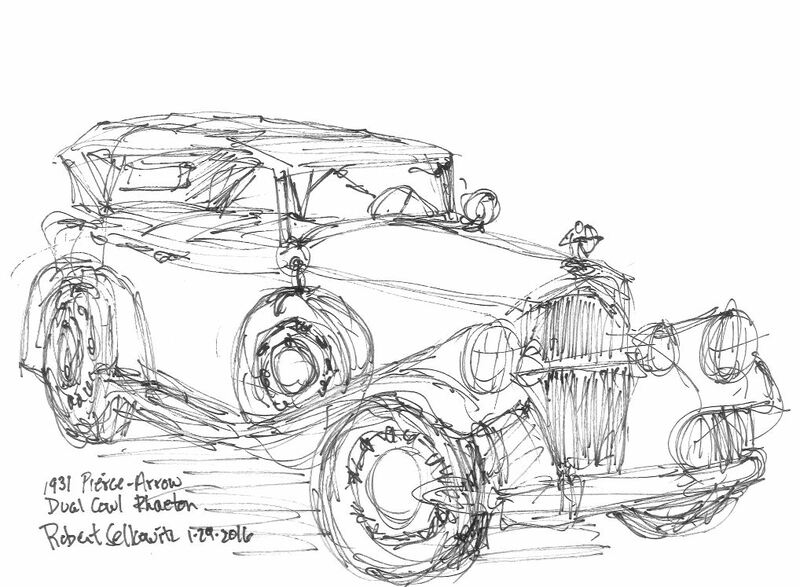 The sketch by local artist, Robert Selkowitz. Thank you for including my drawings in the article. 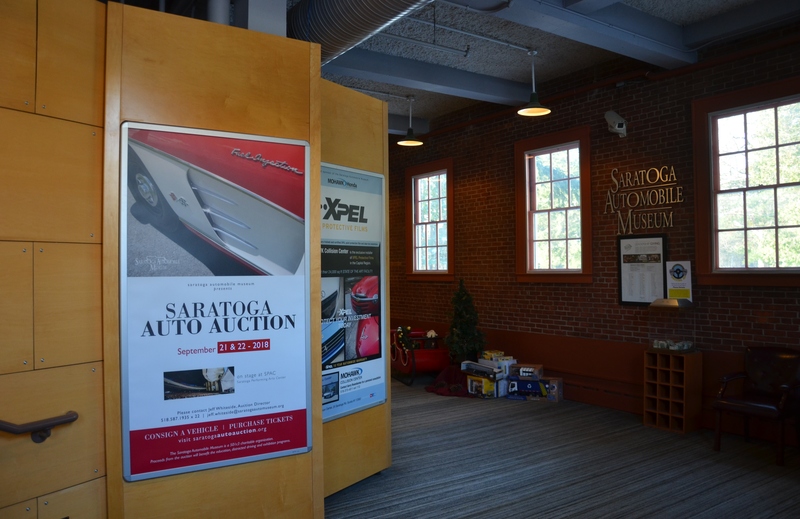 The Saratoga Auto Museum is within Saratoga Spa State Park near the Gideon Putmnam Hotel just off Rt 50. I was amazed by the number of early NY State auto manufacturers illustrated on a giant map of the state in their second floor exhibit. The 1928 Franklin and 1931 Pierce Arrow are proud represetatives of that era displayed on the second floor.